At Janene’s Bridal Boutique we are believe in creating a truly custom experience to our brides. Our owner, Janene has designed and made custom dresses from scratch since her sewing expedition started back when she was a child. 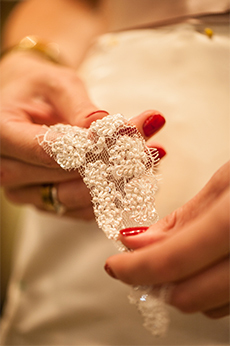 She has the eye and the talent to design and craft a truly stunny and one-of-a-kind bridal gown for your special day. Our brides will bring 5-10 different magazine clippings or pictures of different tops, bottoms, straps and backs that they in vision. At that point you will also talk about materials and any kind of bead work that you are thinking. 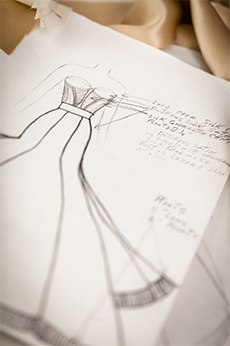 Janene will combine your vision and sketch a dress for your review. Once the custom design is created, Janene will work with you through the time we have and within that time squeeze about 4-5 fittings the last being close to the wedding to ensure it will fit on the day as it should. When you design a dress from scratch you have the say through the process of exactly how you want it. Here are some pictures of dresses and the process of the dress coming together. Please ask questions and advise if this is something you would like to experience.